Why the pool must be filled with water? The concept of a fiberglass swimming pool is similar to that of a submarine. The inside of the submarine must be filled with air or the ocean water pressure will crush it. The same applies to a fiberglass pool, it must be filled with water or the ground water, hydrostatic pressure, will destroy it. What Happens When the Fiberglass Pool is Empty? There is no equalizing pressure (weight of the water) inside the pool, so the ground water can damage the pool in any of three ways. Bulge one or two walls inward until it eventually breaks thru dumping sand and ground water into the pool, thereby relieving the hydrostatic pressure. Push up a portion of the bottom until it opens like a “drawbridge” allowing water and sand to enter the pool, which relieves the hydrostatic pressure (like above photo) Lift the entire pool, or a portion of it, out of the ground about a foot or two, to relieve the hydrostatic pressure caused by ground water. Keep in mind, enough, two or even all three of the above catastrophes can happen. Is the gel coat quality on a fiberglass swimming pool an important factor? Does it really matter? Your fiberglass pool is like a sponge. It is not capable of holding water unless it has a protective coating. The original gel coat has a longevity of 10 to 20 years depending upon your water chemistry. If you recoat your pool with a gel coat the longevity is no longer than 6-years. This is the main reason no manufacturer on the Internet will give a 1-year guarantee if it’s a DIY (do-it-yourself) as a fiberglass swimming pool restoration. What do you do if your pool manufacturer goes out of business and you cannot find a matching gelcoat? Call 906-440-8706 and ask for Matt! The truth is that when you actually dig in and begin investigating gelcoats used in the fiberglass swimming pool industry yourself as I have, you can learn a great deal of information about them. Typical gel coat failure… Good news – SUPER EPOXY SYSTEMS has the answer! The pictures above were recoated on an old one piece fiberglass pool with a typical gel coat and started to fail the first year. After 5-years the entire pool now has the Super Epoxy product on it and was done as a DIY by one of our customers. Super Epoxy, the ultimate fiberglass swimming pool refinishing. Fiberglass gel coats use toxic resins that delaminate. Fiberglass fibers float around in your pool, getting into your lungs or eyes causing irritation or other medical problems. Can my fiberglass pool be fixed? Absolutely! There is no such thing as a fiberglass swimming pool that can’t be repaired. Fiberglass is very forgiving, but it requires some labor and considerable knowledge to repair and restore the pool to its original watertight condition. We are the leading company in America that can provide both the knowledge and the materials to repair and restore your fiberglass swimming pool. But then, you’ve probably already found that out. What are the bubbles that appear on fiberglass panels and fiberglass pools? Back penetration through original substrate from air, water or minerals, is called hydration or pin holes and is the cause for the notorious “Black Plague” in fiberglass pools (bubbles/pockets) and extensive delamination. Depending upon how many blisters you have your pool could be leaking. We can give you the necessary prep to overcome these problems. My children are hurting their feet and elbows from the plaster finish because it is so rough. What can I do? As you found out when plaster ages this is one of many problems that you can have. Step by step instructions during the prep will eliminate any future plaster problems. We are looking at the different options of SWIMMING POOL RESURFACING. Our contractor here in California will offer a 3-year warranty on his plaster finish. If your Super Epoxy is so good why do you only offer a 5-year and 10-year warranty? The 3-year warranty offered on your plaster finish is not worth the paper it’s written on. All the contractor has to say is you did not maintain your water chemistry properly. Super Epoxy has a 20-mil or better thickness application. It is recognized by the BBB. It has a longevity of 10-years or more. I am having problems at this time of constantly have algae that I cannot get rid of. Why is this happening? Your plaster has become a host to algae because it is porous. Super Epoxy is the only pool coating that is non porous when applied and 10-years later it remains the same. I’ve had different SWIMMING POOL RESTORATION companies look at my pool and they told me never to paint my pool with any product epoxy, rubber based etc. They told me I would be repainting my pool every two or three years. This is true. All paints will chalk, blister and flake within two to three years. Our Super Epoxy is an industrial coating with 100% polymers without the junk in it. Best of all we give it a five and ten year warranty. I have a plaster pool that was painted three or four years ago. The paint started to fail after the second year. Do I have to remove all the paint before I do the Super Epoxy? If you have rubber based paint and execute an MEK test, we have your answer! The plaster on my pool is about 15-years old. I am spending a small fortune for chemicals. What can I expect as far as maintenance, chemical savings using Super Epoxy? Super Epoxy is 100% inert. It does not react as plaster does with your water chemistry. You should save at least 50% on all chemicals and you will be able to enjoy it and not be a slave to it. There’s another manufacturer that is offering a 5-year warranty on their EHB epoxy paint. How are they capable of doing this and how does it differ from your warranty? I know the manufacturer you speak of. I put their product on one of my pools seven or eight years ago. I failed after the first year. The second year they sent me free material to recoat it. I followed all their instructions. It failed again. This company will send you new material and back up their guarantee, but they know sooner or later, you will get so disgusted you won’t bother them again. By following my step by step instructions, you will not have to do your pool again for at least 10-years plus. Do it once, do it right. If we apply the Super Epoxy and it fails, what are the conditions of your five and ten year warranties? First, you to send a sample of your failure to the chemist at the factory. The results of the failure will be sent to both of us. As long as you have your control number we will ship you a brand new order and pay the freight at no cost to you. There are only three reasons why pool coatings fail. They chalk first then blister and flake. We assume the responsibility of your failure even though you did not prep your pool properly. Unlike other warranties in the pool industry we have no limitations which are at best fraudulent. In reality you have no warranty at all with this manufacturer. If I should purchase your Super Epoxy, how will I know when another coat is needed? Our product becomes translucent when you get down to one or two mils because it does not contain clays or fillers. At that time you will see a slight difference in color where the primer bond coat is starting to show through. At this time all you have to do is lightly abrade or scratch the pool surface and you’re ready for your new coat. As you know Super Epoxy is 20-mils thick. It will be at least 10-years before you need another coating. How long does Super Epoxy last? FIBERGLASS SWIMMING POOL RESTORATIONwith 20 mils = 10 year warranty and 10 year plus longevity. 2 coats @ 40 mils thick = 20 year warranty with 20 years longevity plus. Using our Super Epoxy we give a 35-year structural warranty that the fiberglass will not fail. Are there contractors who use Super Epoxy? Only authorized dealers apply Super Epoxy according to rigid specifications that assure you the long-lasting protection delivered by our products. 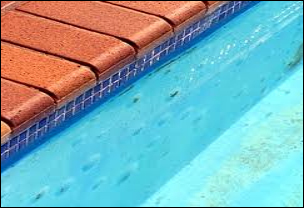 Our trusted contractors are rigorously trained in all aspects of swimming pool restoration. How do I know I can trust Super Epoxy contractors? All authorized independent dealers are fully licensed and insured. Only trained, certified contractors can apply Super Epoxy to meet manufacturer specifications and succeed industry standards. Satisfaction guaranteed. The local pool contractor we have no confidence in, because they don’t call us for every step of application. If you, the homeowner, don’t have the time to do this, you can hire a general contractor or a house painter to do it for you. As long as he calls us for every step, he could save you $5,000.00 to $10,000.00 based on the size of the pool. Best of all we will pass on our 10-year warranty as long as he has a control number. What’s the difference between Super Epoxy , Epoxy paint or EHB Epoxy paint? Super Epoxy is thicker than any paint and it’s not considered “paint.” Super epoxy has a much higher percentage of solids than ordinary paint. As a matter of fact Super Epoxy is 100% solids. Super Epoxy coating systems dry 20 mils thick per coat when applied @ 20 mils. A simple analogy is paint is a piece of paper; Super Epoxy is a piece of cardboard. Can I use my pool as a training seminar and save money? Absolutely. You will pay for the product and expendable materials. Labor will be provided by skilled professionals seeking the Super Epoxy Systems. Call for details. I’m unsure about picking a color or if I will like the product, what can I do? Super Epoxy offers several ways to assist you with your decision making process. First, you can order sample chips of the colors we offer. These 2″ circular chips show the actual product applied so you can see color and the texture. Second, you can order one of the videos from our media library and book selection.